Postharvest quality is not affected by the nitrate to ammonium nitrogen fertilization practices used during production. Plants grown under reduced light intensities often develop reduced light compensation points thus explaining why low light grown plants generally can do better under subsequent low light levels often encountered in homes and offices. By definition, the light compensation for a given plant is the minimum light intensity required when food respired equals food produced. However, in one test, plants grown under high light levels looked better after 3 months under interior conditions compared to those grown under lower light levels. Using growth retardants often produces more saleable plants. Member of the Araliaceae (aralia or ginseng family). Native to Queensland. Commonly referred to as Brassaia actinophylla. 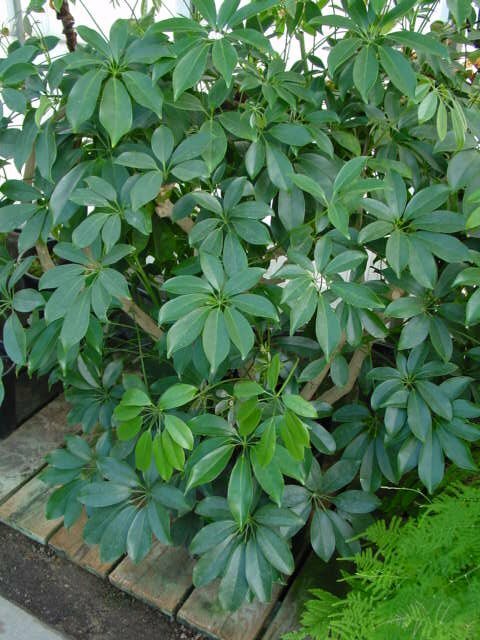 Relatives include aralia, false aralia, ginseng, English ivy and fatsia. Has leaves with long stalks, divided into 7-16 leaflets up to 12 inches long, radiating out like umbrella ribs. Chill sensitive, store above 50F. However, in one test series it was shown that this species could be stored at 45-55F for 28 days. Plants stored for 30 days in the dark at 64F exhibited a temporary reduction in plant quality upon removal from storage but plants recovered in about 3 weeks when placed in a reasonable environment. These differences in recommended storage temperatures might be due to cultivar and/or preharvest growing conditions. It is also reported that the foliage can turn grayish when growing media temperatures go below 60F for any extended period. Named after J. G. Scheffler (1722-1811), a physician in Danzig. The presence of stem roots often means that there are problems with the normal roots. The cultivar ‘Amate’ does well under interior conditions and is fairly tolerant of red spider mites. While it is often treated as a low light loving plant, this species would prefer some direct sunlight, especially in fall and winter. If grown in Florida, plants should have been produced under 40-60% shade. Grown under lower light levels, plants are better adapted for the commonly encountered lower light levels when placed indoors.